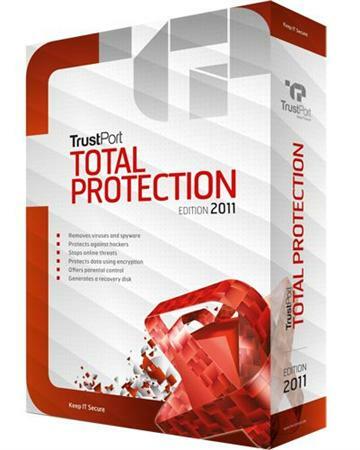 TrustPort Total Protection 2011 protects your computer from viruses and spyware with the use of two top anti-virus engine AVG and BitDefender. All e-mails and Web sites are checked to detect a dangerous and inappropriate content. All sensitive data can be securely encrypted to protect or destroy unused confidential files. The program uses the traditional scanning and heuristic analysis to detect and block all malicious programs that can get on the computer from the Internet or from removable storage media (USB-flash drives, CD / DVD drives). The use of two top anti-virus engine, AVG and BitDefender, TrustPort possible to detect malicious software are among the best in the world. Web page - the most common sources of virus infections, so the program scans all files that are downloaded from the Internet. It is possible to automatically detect the data streams such as audio and video streams that can not be scanned. Typical phishing sites are identified and blocked. E-mail scanned for malware and spam. Invited to complete integration into popular email clients Microsoft Outlook, Mozilla Thunderbird, Outlook Express and Windows Mail. In addition, you can scan all incoming messages from any selected customer. All contacts between the computer and the external environment are controlled. The majority of legitimate applications are recognized and allowed connection to the Internet. Unknown and suspicious attachments are blocked, or in some cases, it is suggested you allow or block them. TrustPort Total Protection 2011 uses a wide range of settings of firewall.